The motivation for improved characterization of heterogeneous GAG mixtures stemmed from the severe global health crisis resulting from the contamination of specific lots of heparin, a widely used anticoagulant, with a non-natural GAG termed oversulfated chondrioitin sulfate (OSCS) . Specifically, this event was a key turning point that raised fundamental questions surrounding the source of the contamination in the context of its biological source, as well as the processing and manufacturing of pharmaceutical grade heparin. Furthermore, this contamination event also raised issues pertaining to existing characterization methods for drugs derived from heparin, including the different low-molecular weight heparins (LMWHs). Our efforts to build tools for robust and sensitive analysis of heparin helped to answer these fundamental questions and enabled the way regulatory agencies evaluated this complex drug and its production. The main biological source for pharmaceutical grade heparin is porcine intestinal mucosa. The crude heparin isolated from this source is impure and often has other polysaccharides present including heparan (HS), chondroitin (CS), dermatan (DS), and hyaluronic acid. Heparin is purified from crude using various methods that take advantage of its high anionic density (2.4-2.8 sulfate groups per disaccharide unit), solubility and stability to heat, acid base, and solvents. Depending on the methods of manufacture and purification, the final “heparin” product is a heterogeneous mixture representing a distribution of properties. Furthermore, the byproducts of the isolation and purification strategy are collectively defined as “sidestream” heparin. Despite such heterogeneity, heparin has been safely used for several decades prior to the OSCS contamination event and, remarkably, despite the fact that, unlike the majority of drugs in current clinical use, there is no chemical description of heparin. Indeed, prior to the contamination crisis, heparin was dosed based on an indirect, non-specific clotting test. For such a critical drug in the acute setting, this lack of chemical definition and control was hugely problematic and prompted us to use our integrated analytical approach to characterize different historical lots of heparins and their sidestream products. By combining different 2D NMR spectroscopy methods including HSQC and HMQ (Figure 3; see detail ) and analyses of these heparins based on their migration in capillary electrophoresis, we identified distinct signatures in pure heparin and signatures of sidestream products. These signatures were found to be highly sensitive and specific metrics to differentiate authentic heparin from heparin containing various amounts of persulfonated GAG contaminants, which would otherwise go undetected using the typical functional assays. Specifically, our studies strongly indicated that OSCS was the major contaminating species in the heparin lots associated with adverse health events and that historical lots did not contain OSCS and had only minor impurities. This indicates that OSCS was more likely to be introduced externally and not as a part of the typical sidestream products. Based on this data and the discriminatory power of NMR, we refined the use of one-dimensional proton NMR as a key quality control test for heparin. Such a test is now a component of the Pharmacopeial reference on heparin. Figure 2: HSQC analysis of crude heparin (black) compared with purified heparin (gold). Crude heparin contains many components, purified heparin contains largely (or only) heparin (black). Signals for CS (red), HA (light blue) and DS (green) are shown. As a complementary strategy, we also took advantage of our detailed understanding of the structure-function relationship of heparinases to develop an enzyme inhibition assay as a means to detect sulfated GAG contaminants in heparin (Figure 3). We showed that OSCS competitively inhibits the activity of heparinase I and, to a lesser extent, the activity of heparinases II and III. Furthermore, we showed that even a low amount of OSCS in a heparin mixture significantly inhibited heparinase I activity making competitive inhibition a sensitive tool for detecting OSCS. From our studies and work of others, there was also concern that persulfonated GAGs, such as oversulfated dermatan sulfate (OSDS) and oversulfated heparin (OSHP), may be present in side stream heparin, and possibly contaminating pharmaceutical heparin. OSDS showed lesser, but still potent, inhibitory capacity compared to OSCS whereas OSHP showed very similar inhibition capacity to that of OSCS. Finally, by quantifying GAG fragments resulting from heparinase I digestion of pure and contaminated heparin and benchmarking this profile with known standards from pure heparin oligosaccharides, we developed a system to rapidly quantify oversulfated GAG contaminants in heparin based on their competitive inhibition of heparinase activity. Figure 3. Competitive inhibition of heparinase I by OSCS. Building further on our efforts to characterize the contaminant species in heparin, we developed analytical methodologies and integrated workflow to characterize complex GAG mixtures such as heparin and applied these methodologies (in collaboration with Momenta Pharmaceuticals) to characterize biologically derived heparin sulfate material from bovine kidney (HS). A general notion of structure of HS was that of a polysaccharide chain(s) that contained segmented domains with distinct signatures. The NS domain represented sulfated domains comprising of iduronic acid (with or without its 2-O sulfation) and N-sulfated glucosamine sugars. The NA domain represented acetylated or undersulfated domains that predominantly comprise glucuronic acid and N-acetyl glucosamine (with or without 6-O sulfation). Interspersed between NA and NS domains are transition domains that contain mixed attributes of both these domains. While isolated HS oligosaccharides had been previously sequenced, there was at the time little direct experimental evidence of this domain organization of HS. 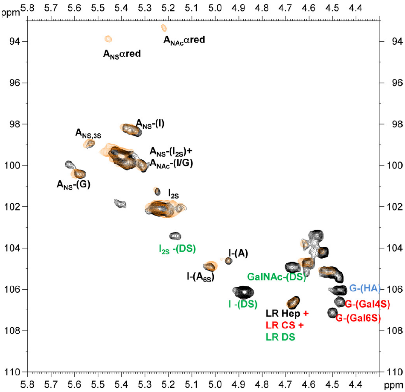 In this study, we show that sequence abundances within HS are likely to be such that HS contains highly organized domain structure and that blocks of 2-O-sulfated disaccharides are biased towards the non-reducing end, with a clear relationship between HS chain length and 2-O-sulfation level. 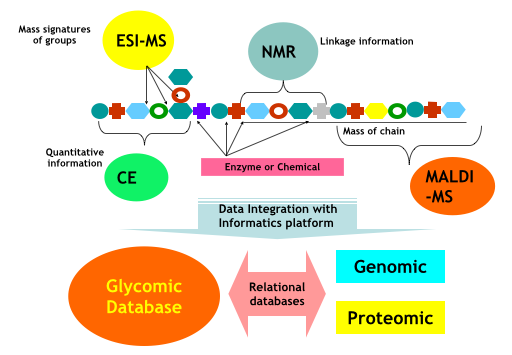 Taken together, our analyses provided insight into HS fine structure and provided a platform for analysis of complex glycan mixtures as a class.